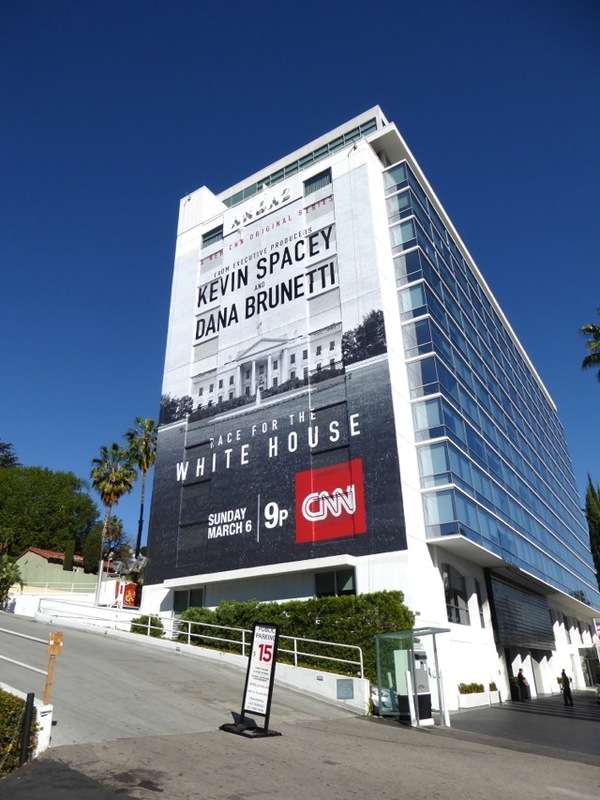 Kevin Spacey certainly has a penchant for U.S. politics, whether it be starring along side Robin Wright for a fourth season of Netflix's hit House of Cards, or executive producing CNN's Race for the White House TV event this weekend. 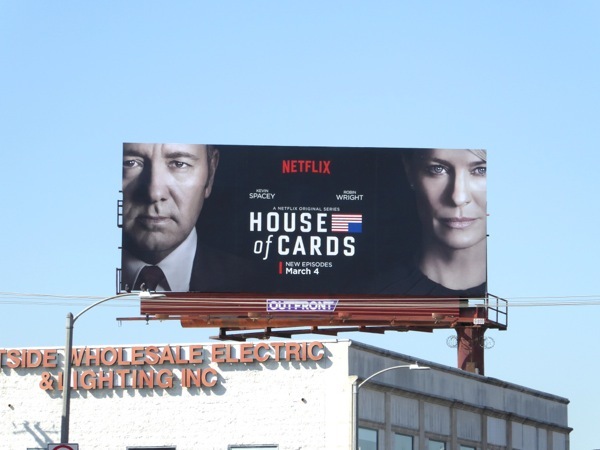 When we were all introduced to 'Frank Underwood' back in 2013 in the U.S. remake of 1990's British mini-series, we never thought we'd meet such a dastardly politician, who would do and say anything to get ahead and into the Oval Office. However the latest U.S. Presidential Election has proven there are far worse characters out there in real-life. After walking out of the White House (and their marriage?) at the end of last season, what's next for First Lady 'Claire Underwood' and who else will need to be murdered in the future to help keep all their dark secrets. This season Neve Campbell from the Scream film franchise will also join the cast, so it's lucky she's used to dealing with ruthless back-stabbers. 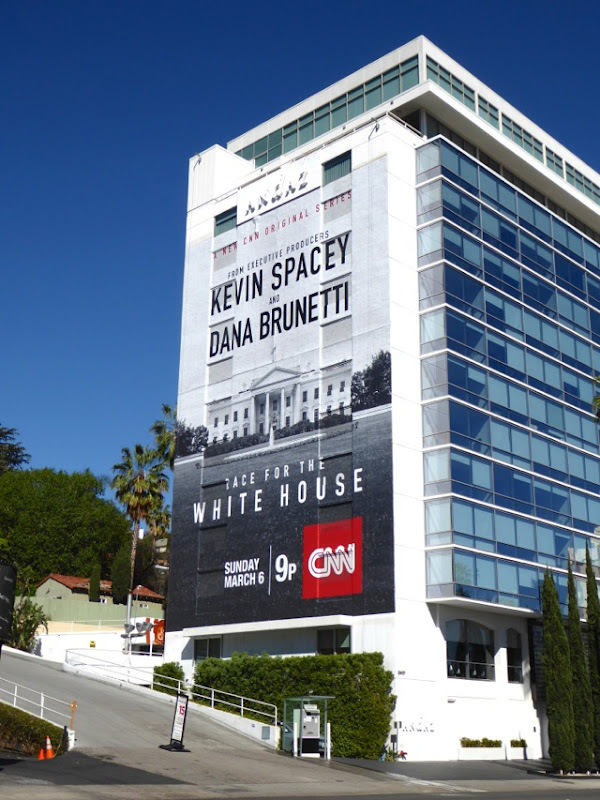 If you're not too busy binge-watching new episodes of House of Cards this weekend, then maybe you'll also have time to watch CNN's Race for the White House. 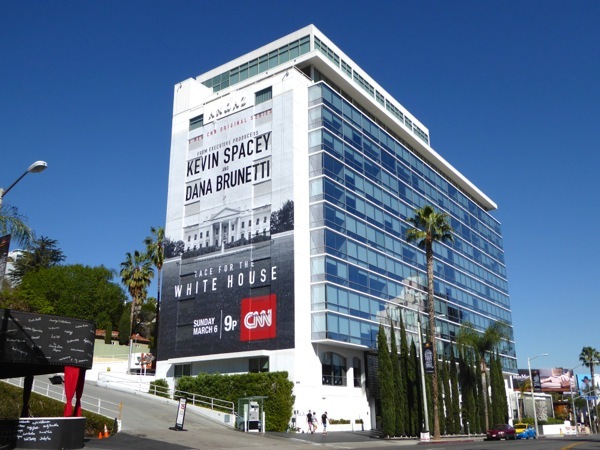 Perfectly timed, the six-part documentary series narrated by Kevin Spacey examines some of America's most memorable and dramatic election races, with compelling archive footage, interviews with historians and political analysts and even dramatised recreations of events. Enjoy monumental battles like JFK v. Nixon, Bush v. Clinton and Lincoln v. Douglas to name but a few. 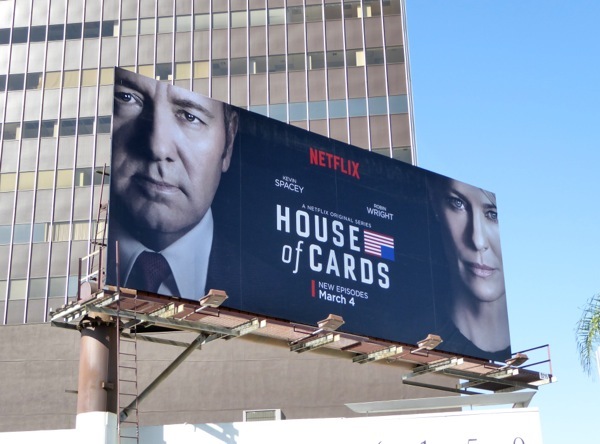 The season four billboards for House of Cards (which seem a bit simplistic and choose to focus on the show's two most compelling subjects) were spied high above Beverly Boulevard and along Wilshire Boulevard on February 25, 2016. 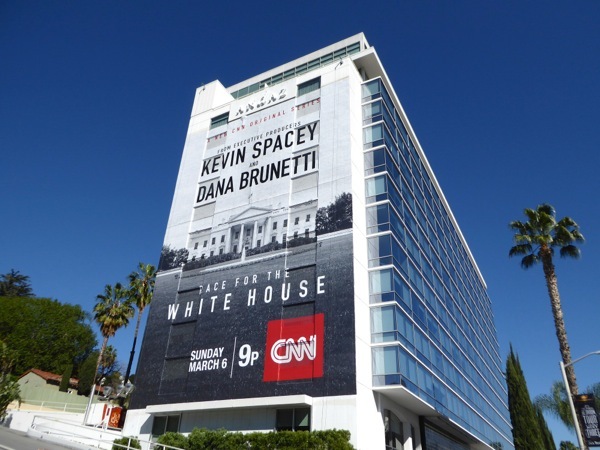 Meanwhile the giant-sized billboard for Race for the White House, which features the iconic 1600 Pennsylvania Avenue mansion in Washington, D.C., was photographed earlier in the month on the side of the Sunset Strip's Andaz Hotel in West Hollywood on February 15, 2016. 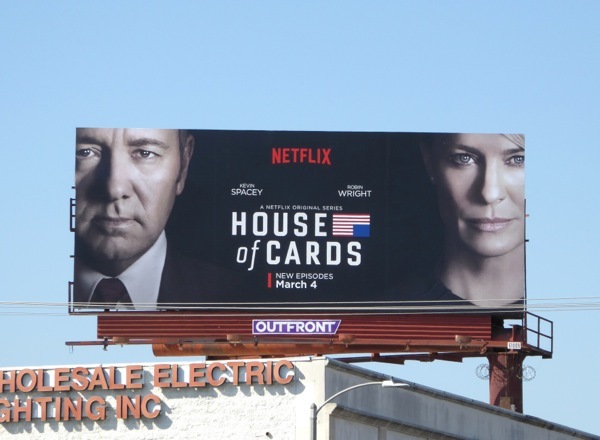 If you're a fan of the binge-worthy Netflix drama, be sure to check out all the previous season promo billboards for House of Cards. They say money makes the world go around, but at times like these are you sure it's not political scheming? 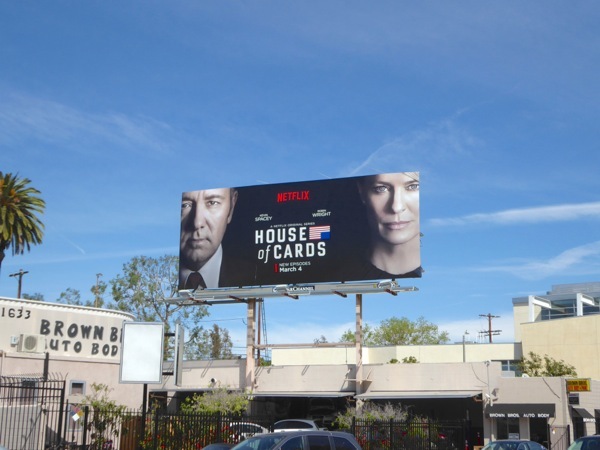 UPDATED: Here's another season four billboard featuring the Underwoods, snapped along Robertson Boulevard on March 22, 2016. 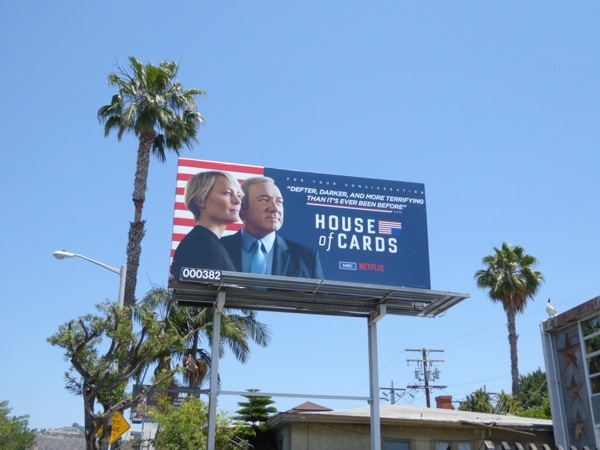 UPDATED: The campaigning never ends for the Underwoods as here's a patriotic Emmy consideration billboard of the fourth season, spotted along Fairfax Avenue on June 8, 2016. 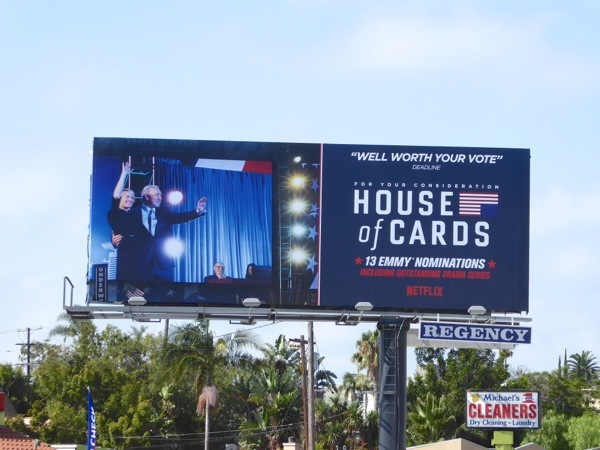 UPDATED: This election season the Underwoods are still looking for your votes to help convert those thirteen Emmy award nominations into wins. 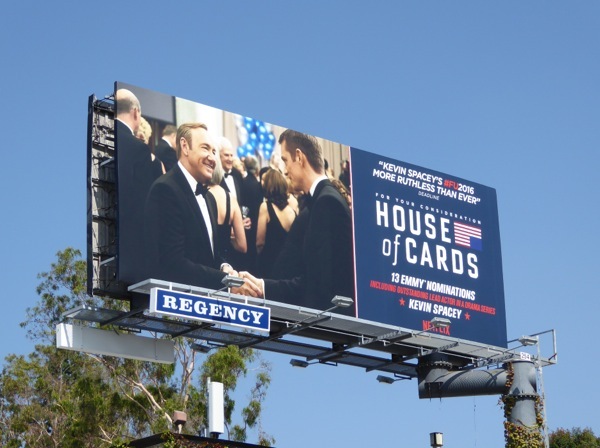 These Emmy nomination billboards are just the ticket to help convince TV Academy members to support House of Cards fourth season and were spotted along the Sunset Strip on August 11, 2016, and along Olympic Boulevard the next day.